The difference between this and this one (click here) is just that this one (the sensor) has the spring strip outside the tubing, while the sensor ace has hidden binaurals. The hidden binaurals are a slight positive in favor of this one and therefore this one is discounted a little more, but they are both airtight machined, made in Japan. This precision instrument from Japan has airtight chestpiece machining. Airtight machining is crucial to sensitivity and professional quality. Sensitive and comfortable to use. Includes two pair of eartips (white plastic, soft rubber mushroom). Blue tubing with regular binaural spring. Regular pricing was $29.99. Really this is an extraordinary price. The only reason it's being sold in the 20 dollar level is because it isn't getting its fair attention. It's on par with 100 dollar instruments. 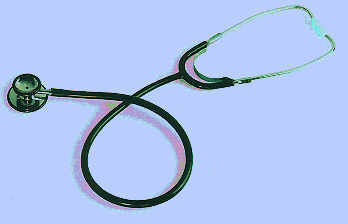 But if you want to pay 5 dollars for a cheapie stethoscope, be our guest; we sell those too. This product was added to our catalog on Tuesday 12 August, 2008.